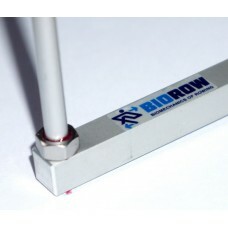 The BioRow Oar Angle Guides are an effective tool for easy, reliable and accurate MEASUREMENT and CONTROL of the catch and finish oar angles. 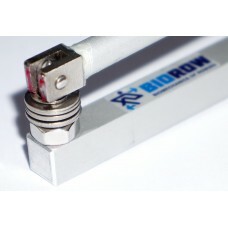 BioRow™ Angle Guides can be quickly installed on any boat without modification and removed in seconds if not needed. The angle setting procedure is accurate and requires only a tape measure. 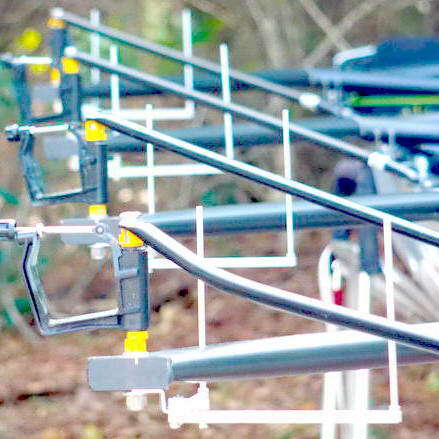 They can help to achieve better SYNCHRONISATION in a crew: rowers can hear the clicks when the oar shaft touches the metal guides and they can synchronise their movements according to these sounds. 1. The scale on the base (Fig.1) could show the approximate angles ±2deg. These depend on the thickness of the oar shaft, the sleeve design and its position in the oarlock. In this case, the base must be properly aligned during its installation: align the levers at the zero angle line, then turn the base to align levers perpendicularly to the boat and fix the base with a nut. 2. For the most accurate angle definitions, the oar should be placed in the oarlock handle-first - the shaft should be approximately in the centre of the oarlock, 4cm away from the pin for the catch angle, and 6cm at the finish. 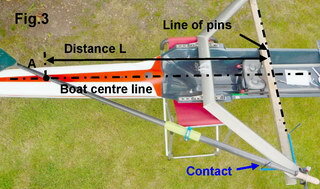 Put the oar shaft into contact with the vertical rod and measure the distance L from the line of pins to the point A, where the shaft crosses the centre line of the boat. The angle could be found using the attached Tables 2 and 3 using this distance L and the span in sculling or spread in rowing. To MEASURE the angle at which a rower rows, the bolts under the levers should be semi-tightened, to let them rotate with a small force. 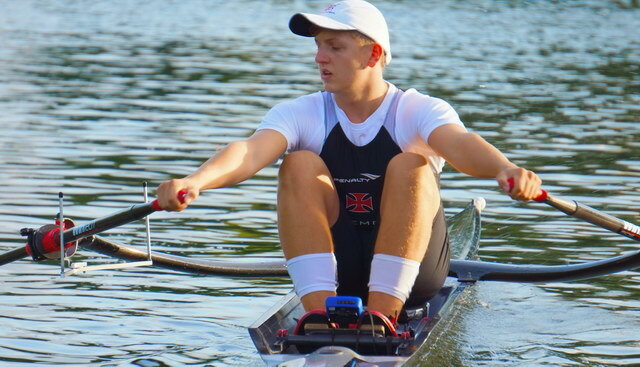 When rowing on the water, the oar shaft pushes the levers to the position of the longest angles at catch and finish, then the angles could be measured off water. 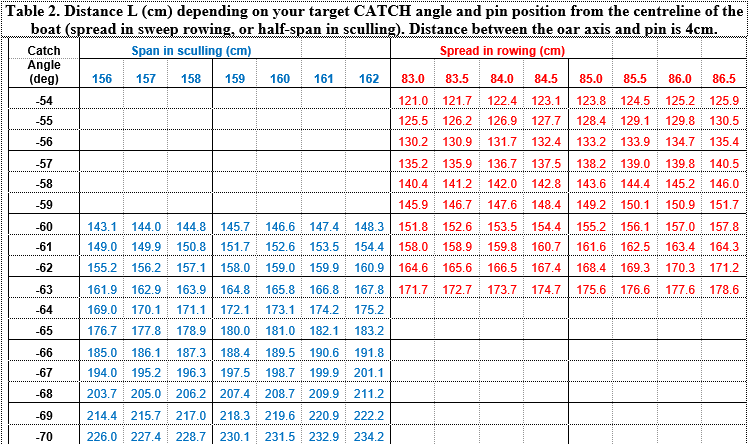 Table 1 gives target angles for Olympic level rowers, which can be decreased by 3-5deg for club rowers. To CONTROL the angles, the sequence is reversed. 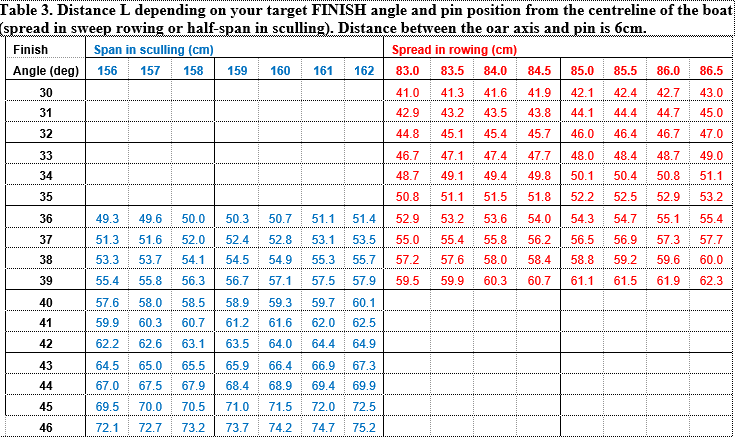 Firstly, define your target catch and finish angles and find out the distances L from Tables 2 and 3. Then, mark point A on the boat's centreline at the distance L from the line of the pins and put an oar across the oarlock and point A. Release the two bolts at the bottom of the lever, and rotate the lever until the vertical rod touches the oar shaft on the outside. 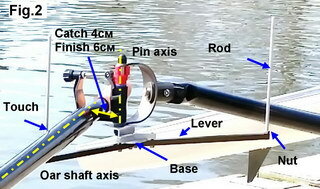 Tighten the two bottom bolts and check that the vertical rod is still in contact the oar shaft. 1. 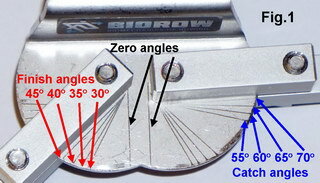 Stainless steel low profile base (Fig.4, b) is the most durable and useful option (Its only limitation is that it can’t be used for the finish angle in two-stay carbon riggers). 2. Aluminium high profile base (Fig.4, c) could be used on any rigger types. 1. Plain aluminium solid rods (Fig.5, a) are the simplest and cheapest option, and they can be used in most cases. 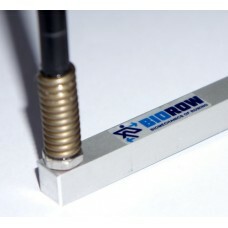 We hope you enjoy using your BioRow™ Angle Guides, and rowing faster! Standard version of the Angle Guides with solid aluminium rods ..
Vertical rods could be quickly folded down for easy storage and quick ON/OFF switching on water. .. Angle Guides with spring rods are more robust, and are better for beginners ..